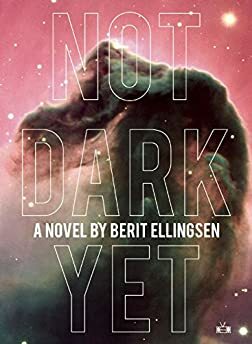 Largehearted Boy: Book Notes - Berit Ellingsen "Not Dark Yet"
Book Notes - Berit Ellingsen "Not Dark Yet"
Berit Ellingsen's novel Not Dark Yet is disturbingly suspenseful, an unsettling and remarkable book. "Ellingsen (Beneath Liquid Skin) projects a feeling of encroaching darkness on every page, 'the shadow of a Kraken passing beneath the surface,' and this tension guides the narrative like a purposeful current. Expansive and unsettling descriptions make it easy to fall under the story's spell. This is a remarkable novel from a very talented author." In general I don't listen to music when I write, whether I'm writing fiction or non-fiction. The same goes for editing. Thus, there are few tracks I listened to whole writing Not Dark Yet, but there are several I had in mind during the process and which I listened to between the writing and editing. Here are some of them. Xavier is a track from Dead Can Dance's second album In The Realm Of The Dying Sun. I first bought this album when I was 15 and it's followed me since. I listen to it regularly, and every time it strikes me how powerful the music is and how archetypal the lyrics are. I will probably always own a copy of this album. It's something of the most perfect and timeless music I know. Godspeed is the band I'd prefer made the soundtrack for Not Dark Yet. Their songs are very powerful and Moya from the EP Slow Riot For New Zerø Kanada is my favorite of their work. Their music is melancholic, dark, but also hopeful, and boldly outspoken about the state of our world. When this track came out it, it immediately became a hit in trance music circles Europe. The clear rising and falling of this track is a lesson in building tension and anticipation, which should be useful for any storyteller. I listened to this track on and off when I wrote Not Dark Yet and during the rounds of editing that followed. I also wrote about it in my short story "Dancing On The Red Planet." This is one of the few tracks I had in mind when I wrote Not Dark Yet. The city which the early parts of the novel are set in, is wrapped in an autumn fog that doesn't seem to end. This song makes me think of empty city streets in the fog and gray light that appears right before dawn in the late summer and early fall. Perhaps the only time in the 24 hour cycle that the streets of a modern city are empty. Stalker is the film that inspired Not Dark Yet the most. The rain scene at the end of Stalker is something I watch again and again, maybe as often as once a year. Tarkovsky was an expert at filming water, its surface and light, and I think his treatment of water was very much at the back of my mind when I wrote the novel. The same with his long, slow, expansive takes of the characters set against the landscape. This track is from a scene of a dream of water. This track was used as opening theme for the Danish-Swedish crime series The Bridge. The series uses the Scandinavian climate, winter darkness, and its cities, which are a mixture of historical architecture and modern design, to tell very intense and dark stories that are somehow personal and cold at the same time. All of that definitely inspired Not Dark Yet. The further away I get to the novel, the more Scandinavian I can see it is. Etienne de Crecy made French electropop before Daft Punk got big. This particular track has a fantastic music video made entirely with computer graphics, but having a whole unique look and architecture. The scene in Not Dark Yet where the protagonist walks through a whole unfinished neighborhood was inspired by the sequence of unfinished houses you can see in the middle of this video. This is a video made from timelapse photography taken from the International Space Station, showing bright cities, clouds, lightning, northern and southern lights of various colors, and the stars. The music is from a science fiction movie called Sunshine. The video clearly shows the Earth from space, seen against the enormous background of the cosmos. The connection here is that the protagonist in Not Dark Yet participates in testing for an astronaut program and wants to go to space. Maybe the most perfect pop song ever made. It's about not knowing what's happened with the person you loved once upon a time, and trying to get hold of them again. Something about this song is also deeply urban. The name of the band indicates someone who gets everything in the end but their love. There are whole novels in that name. I've seen comments about this song being about revenge long-coming and secrets forcing themselves to the surface, and I agree with that. Those are themes that inspired Not Dark Yet. The dark tone and feel of this song makes it a fascinating whole, even though it's pure pop, even 80s pop. It's one of the most operatic pop songs I know, and I like the melodrama of opera.